Japanese Painted Fern is a unique small growing fern. It has a beautiful display of showy deer resistant fronds and grows well in shady locations. I have seen this fern grow in full sun but by the time summer rolls around I have noticed scorching on the leaves. 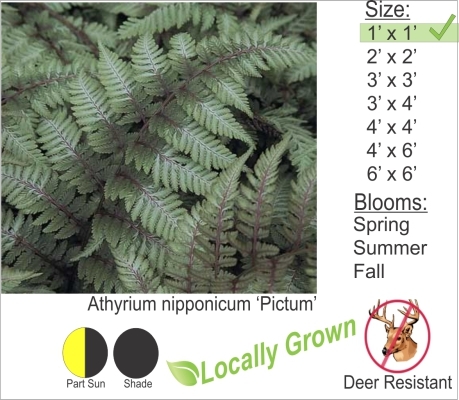 This fern requires well draining organic soils and should be planted in the shade or part shade keeping it out of the hot summer afternoon sun.